La Shish Owner Indicted: Does Your Fave Mid-East Restaurant Fund Terror? You never know where the money you pay for shawarmeh or falafel is going. Today, Talal Khalil Chahine, and his wife, Elfat El Aouar, were indicted for income tax evasion and skimming and concealing over $16 million. Chahine is the millionaire owner of La Shish, a chain of Middle-Eastern restaurants throughout its suburbs. If you live in Detroit and are schooled in either its Islamic community and world of federal law enforcement, this is hardly news, and you’ve known for years not to eat at La Shish. That is, if you’re not then-Homeland Security chief Tom Ridge, former DHS official Asa Hutchinson, Michigan/Ohio Immigration and Customs Enforcement (ICE) Special Agent in Charge Brian Moskowitz a/k/a “Abu Moskowitz,” Homeland Security “civil rights” advocate Daniel Sutherland, and assorted others. As I’ve written, they and others have supped with Muslim supporters of terror at La Shish’s Dearborn restaurant multiple times. As for the rest of us, we know that La Shish owner Talal Chahine is involved with a lot of nefarious things. And we know that La Shish restaurants weren’t making that much money. Most of the $16 mill came from other “activities.” A Shia Muslim, who is a member of the Hezbollah mosque, Chahine was suspected of making his money from drug-dealing, and using his restaurants to launder the money. Relatives of his, got federal prison time for dealing and were believed to have taken the fall for him. His son, Khalil, was twice arrested for drug-related offenses. Not long ago, that same son, Khalil, was convicted of murder. 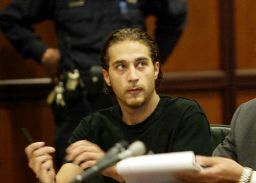 He murdered Paul Hallis, a Maronite Christian Arab, for the crime of daring to become engaged to a Muslim woman–a woman who reportedly dated the younger Chahine AND his married brother-in-law, Ali El-Ozeir. Yes, there are Islamic honor killings in America. 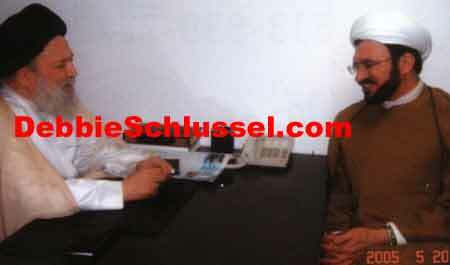 And FYI, prior to his jail stint for murder, Khalil Chahine was the youth leader at the Hezbollah mosque. Last year, the IRS raided La Shish for income tax evasion. It was known that Chahine sent a lot of his money back to Lebanon, where it was believed to fund Hezbollah terrorism. Sources say Chahine also was a loan shark to members of the Islamic community, in addition to the alleged drug dealing. When agents raided his La Shish headquarters and two homes, reports said IRS agents found fake documents (passports, etc.) 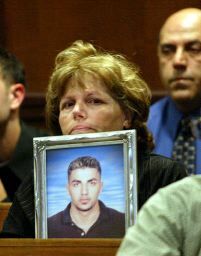 and tapes showing that Chahine tried to bribe witnesses to lie at his son’s murder trial. Chahine’s criminal enterprises and likely funding of Hezbollah has been known for years. Yet, Abu Moskowitz refused to allow his ICE agents to investigate. His best buddy, “former” Islamic terrorist and FBI award revokee, Imad Hamad, whined about the raids when the IRS finally did them (with ICE agents standing by to watch). And maybe Abu M just didn’t want to upset Hamad buddy and benefactor/lawbreaker Chahine. Leave it to the IRS, which–as with Al Capone–always gets its money, to be less politically correct about Muslims and more focused on enforcing the law. 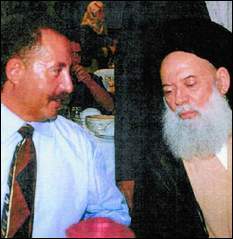 While the IRS has a photo of Chahine with Hezbollah spiritual leader Mohammed Fadlallah, Chahine’s contributions were not directly to Hezbollah, but to Al Mabarrat Association. It has a Dearborn, Michigan affiliate, Al Mabarat Charitable Organization (note the U.S. version uses one “r”, the Lebanese version–two “r”s). 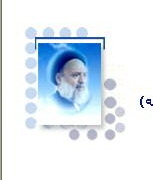 Al Mabarrat is clearly an open front for Hezbollah, and has Fadlallah’s photo on its website front and center. Despite that, U.S. Attorney Stephen Murphy III and the IRS refuse to prosecute the U.S. branch of the charity for apparently violating the law and apparently donating the money to Hezbollah. And the State Department and Office of Foreign Assets Control and the Department of Treasury refuses to put either the Lebanese or American charity on the State Department terrorist list. On the contrary, the U.S. government allows it to operate and has licensed it as a 501(c)(3) tax-deductible organization, subsidized by American taxpayers. 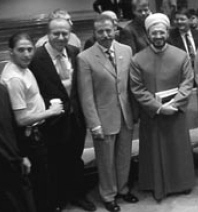 And, by the way, as I’ve noted, Chahine’s imam, Elahi, openly meets in Lebanon with Fadlallah all the time. Al Mabarat Charitable Organization’s Dearborn officers–Fouad T. Beydoun, Ahmad J. Bazzi, and Nazem Baydoun–are from families that all come from Bint Jbeil, the Hezbollah stronghold in the South of Lebanon. Al Mabarat Charitable Organization’s taxes show annual outlays of close to $1 million, but improperly fail to provide a separate schedule listing where the money went. Where is the money going? It is interesting to note that Chahine was indicted now, over a year after raids on his restaurant. That gave him plenty of time to flee the country. My sources told me long ago that, just after the raids, he fled to Lebanon and wasn’t coming back. This whole thing is very embarrassing to Murphy, since–as I wrote last year–he appeared at the Hezbollah mosque and joked and laughed about whether Hezbollah was a terrorist group. And he clapped enthusiastically when the mosque’s Imam, Mohammed Ali Elahi, said that “the group in the South of Lebanon [Hezbollah], that’s not terrorism. That’s legitimate resistance.” (FBI Special Agent in Charge Daniel Roberts, and Abu Moskowitz clapped, too.) That “group in the South of Lebanon” is where Chahine–a key financier of the Hezbollah mosque–was sending his money, according to sources. The same machinations are present throughout the Justice Department, which, last year, indicted Tareq Hamdi–a Bin Laden associate–while he was out of the country (like he’d come back after that). War on Terror? Only if you like the PR of indictments. With terror defendants alerted ahead of time by federal officials, they’ll never face justice. Blame our clumsy, clueless, and weak U.S. Department of (non)Justice for terrorists and terror financiers going free. Yet again. Maybe i should take Al Sharpton out on that date…HE still seems to think that there’s Jews rapaciously present in the ghettos,,WTF??? i KNOW FOR A FACT about these servants of Allah screwing the children of crack whores…and let’s just say those that i know of have seen their pederastic careers come to an end…so what you’re saying HERE comes as no surprise. I think black leaders in this country must be paid off by some kind of Arab lobby if they’re not speaking out about what’s going on in our cities in America these days. Honestly if they got up and focused their whining on the injustice of that happening while the American government only cares about Arab terrorists outside the country, I wouldn’t only not have a problem with that, I would get behind it. I am just shocked people like you exists in this wonderful country of Ours. Shouldnt you be somewhere were extremists get along, Such as Afghanastan, or Jerusalem? Shocked? Why? Seems to me you`d rather do a trade with the devil Ibrahim Hooper of CAIR. He can teach you some about `extremists`. And what `wonderful country` are you talking of? You are fast becoming a muslim country. You have thrown out your own ideals and replacing that with that of the 7th century. Whether the death toll was sixty million or a hundred million, the damage and destruction to the United States was complete. The United State had ceased to exist, as had sixteen major US cities. The American Age had come to an abrupt end. Historians would look back at nation the led the world in commerce, science and the arts and wonder how a small embittered Iran could have been allowed to perpetrate its lethal death-stroke. The signs were all there: the nuclear program, the missile testing, the technology acquisition patterns and event the test firing of cruise missiles from containers. Human rights groups are raising alarms over a new law passed by the Iranian parliament that would require the country’s Jews and Christians to wear coloured badges to identify them and other religious minorities as non-Muslims. Debbie some of these federal employees are probably on the take. Perhaps you could do an expose on their suprisingly affluent lifestyles. I’m sure they wouldn’t mind some old fashioned investigative journalism. I quite agree, Shleppy. There may be other things going on as well. Perhaps a little good old fashioned conversion to Islam…or perhaps a little good old fashioned anti-Semitism…or in the case of Abu M, a little self-hatred. Your posts are right on the money! I can’t believe The Surgeon conned me and Dr. Tony to go to La Freak. I told him the place was a terrorist front. It all sounds pretty sinister and hard to believe. Could it be possible that Hezbollah caught wind of the fortune Chahine was making and extorted from him? It seems sorta crazy for someone to build a good name for themself in their community and then throw their restaurant empire in the toilet. I think his family’s lives in lebanon could have been threatened, forcing him to give into demands of large amounts of money. THE GUY IS IDEOLOGICALLY COMMITTEED TO HEZBOLLAH. HE NEVER THOUGHT ANYTHING WOULD HAPPEN TO HIS “GOOD NAME.” YOU NEED TO UNDERSTAND THE COMMITTED JIHADIST IDEOLOGY. THIS WAS NOT A MATTER OF EXTORTION. IT WAS A MATTER OF EAGER, VOLUNTARY, COMMITTED DONATION. Joseph – I commend Debbie for speaking the truth about Talal Chahine, something your family is unfamiliar with. How can you be so blind to see what is going on here? If your uncle is such a stand up character why is he hiding in Lebanon? Is he still searching for Paul Hallis’ murdererer as he claimed shortly after his indictment more than six months ago? I think he is in Lebanon trying to bride more Lebanese officials and obtain bogus confessions from El-Ozeir. If you are are so truthful why aren’t you telling people that Talal Chahine was bribing witnesses in his son’s murder trial? If it wasn’t for the IRS raid during the trial that evidence would have remained buried in his vault. I appreciate that you are keeping watch on the LaShish situation. Frankly I’m disappointed with having to stop going to one of my favorite restaurants due to the terror links. My only hope is that the chain will be sold to a reputable organization. WHOEVER IS SPEAKING ON MY BEHALF CAN DARN OFF WILL YOU?..I DIDN’T WRITE ANY OF IT HOW STUPID YEARS LATER SOMEONE WANTS TO MOCK MY NAME LIKE THAT.. I guess Israel was funding his projects in Michigan..he’s been a mossad agent since the year 2000…and escaped the USA with the help of the mossad.